We are excited to announce the launch of our new mobile client that is accessible by smartphone or tablet! Technology has made the world that we live in much faster paced and now with the new mobile client you can access your InsFocus reports and analysis on the go wherever you are We believe that this new mobile client will be especially helpful for marketing executives and underwriters as they collaborate with agents in or outside their office. 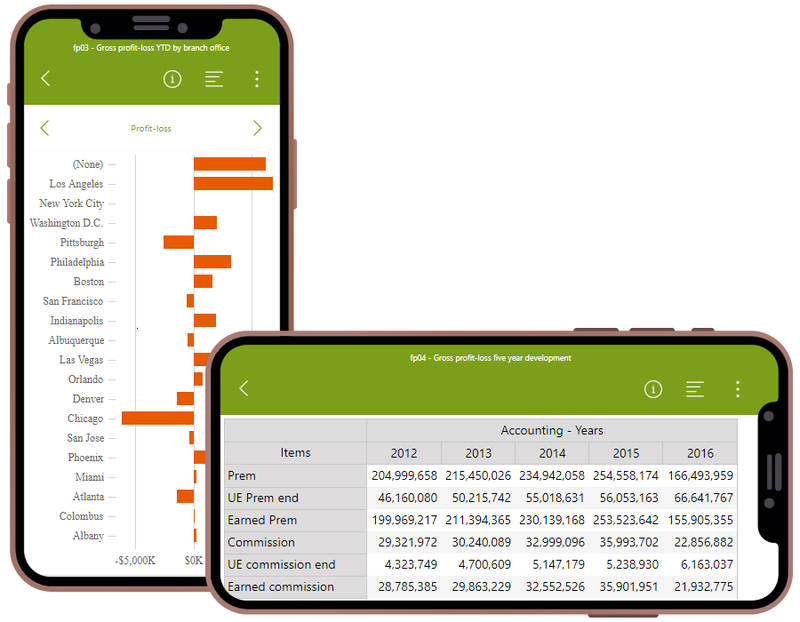 Your entire BI library is now mobile – The mobile client gives all users the ability to access any InsFocus report without any special customization or further action. 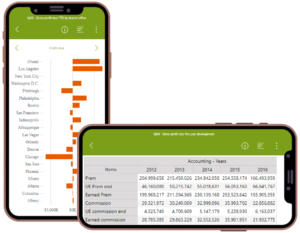 So, whether you’re at an office, at home, or in a meeting somewhere else, all of your reports and information are right at your fingertips. There’s no need to carry around a bunch of documents or a computer, and this gives you the freedom of always having the information you need as long as your mobile device is with you. 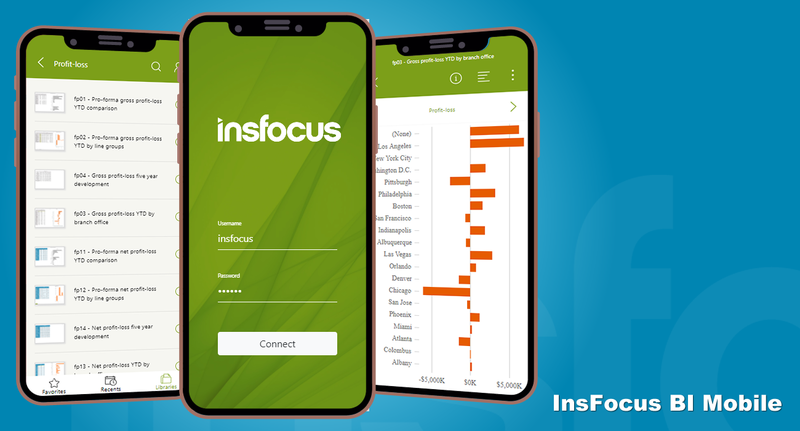 Built using latest technologies – InsFocus built the mobile client with Angular 5 and Bootstrap, which are two of the best current technologies used by big brands like Microsoft, Google, Twitter, Walmart, etc. This helps create the best user experience possible by making sure the mobile interface works smoothly and is run by the most up-to-date technology. Get the information you need without all the glitches! Highly responsive – This application is designed to work on all mobile phones and tablets, and adjusts the look and feel of the software to provide the best user experience no matter what device you’re using. No one will have to miss out on the benefits of the new interface because of the brand or type of mobile device they own. So, you can start using the mobile client right away on all of your devices. The appearance will always match the type of device for enhanced usability. No installation – What makes this mobile client special is that it is built as a PWA (progressive web app), so it is loaded using the browser on the mobile device and therefore it is not necessary to open a pre-downloaded app. This allows the user to access the mobile client directly from a simple link instead of spending time installing a new application on their mobile device. Security – Security is a top priority for InsFocus BI’s and we developed the mobile client with focus on security. Key security features include two-factor authentication and allowing users to login using a SMS token or Google Authenticator. So, there is no need to worry when using the mobile interface; InsFocus will continue to keep your BI information safe and secure! Collaboration – Have you ever been on the go and found an interesting insight that you want to share with your team? Using InsFocus BI’s mobile client, you can now easily share it right from your phone or tablet. This saves you valuable time to share the best information with the right people. Go mobile now to check out all these features for yourself on InsFocus BI’s new interface! 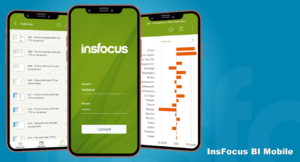 InsFocus BI has developed a new mobile client to complement the normal web client that delivers your information better and faster on mobile devices. The interface is highly intuitive to meet your needs on the go. Your security is our number one concern! A Two-Factor authentication system is in place to protect your account and keep all of your information safe. Your entire library is generated in-browser so that you can easily find and access the report you need. Easily switch between reports during meetings directly from your mobile device. Clicking on the report information button from the library brings up all the details regarding that report, including the date that the report was last modified. You don’t have to waste time opening a bunch of reports looking for specific information with the details easily accessible from the library. The mobile interface runs through a browser, so there’s no app download. This saves you time and space on your device so that you can open the client instantly. Access any report or graph directly from your phone or tablet wherever you are. Now you can have all the information you need on the go. The new mobile client is built using the latest technologies for the best possible user experience. All of your information will be custom formatted to your device so that the appearance is smooth and intuitive. Share information with a co-worker directly from the mobile client! Include a personalized message to explain why you’re sharing this information or what the recipient should be looking at. This interface makes communication effortless to share information exactly where you need it to go.